Your business your profits, your customers, and your employees don’t need to suffer through the issues caused by slow or clogged drains or sewer pipes when we have expert one-day service ready to help no matter if it’s a main drain or branch coming off the main drain. We can expertly diagnose the problem as needed using video scoping and use those results to recommend and implement repairs or replacements. We’re a company you can trust to fix it properly the FIRST time and the price we quote to you at the beginning of the job is the price you’ll pay at the end of the job with no surprises in between. No job is too small or too big! So when your business is dealing with a plumbing emergency, or you need to upgrade, we want to be your first call as our trucks are equipped with emergency parts, and a wide selection of specialized equipment for commercial plumbing needs. 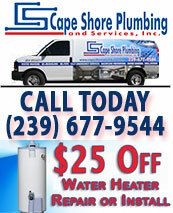 Cape Shore Plumbing has earned and continues to earn the trust of customers, by being committed to good craftmanship and prompt service. 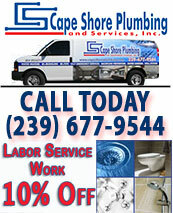 We give you an estimate you can rely on and no extra labor charge on weekends! 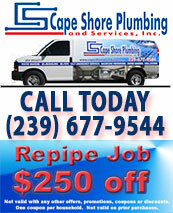 Call Cape Shore Plumbing at (239) 677-9544 Today!